Italy is being hit by an economic tsunami caused by the high costs of mineral commodities which is destroying its industrial system and plunging the country in a deeper and deeper crisis. 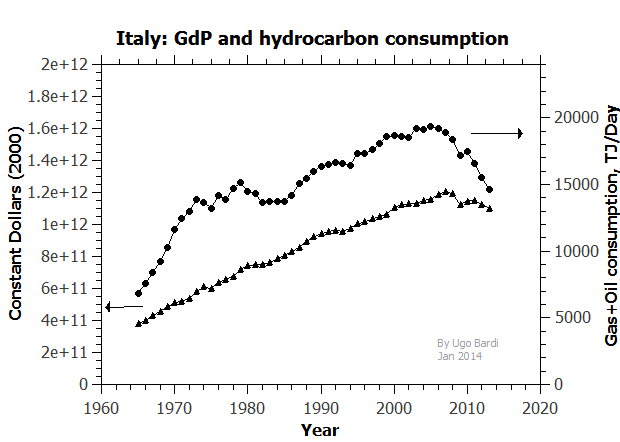 Unfortunately, the Italian government seems to be still locked in the obsolete paradigm of "restarting growth" no matter at what costs and that is worsening the problem instead of solving it. Others are trying to solve the problem by turning Italy into a giant amusement park for foreign tourists, obviously not a long term solution. However, some Italian companies are trying to fight the collapse by being more efficient, more innovative, and more creative. 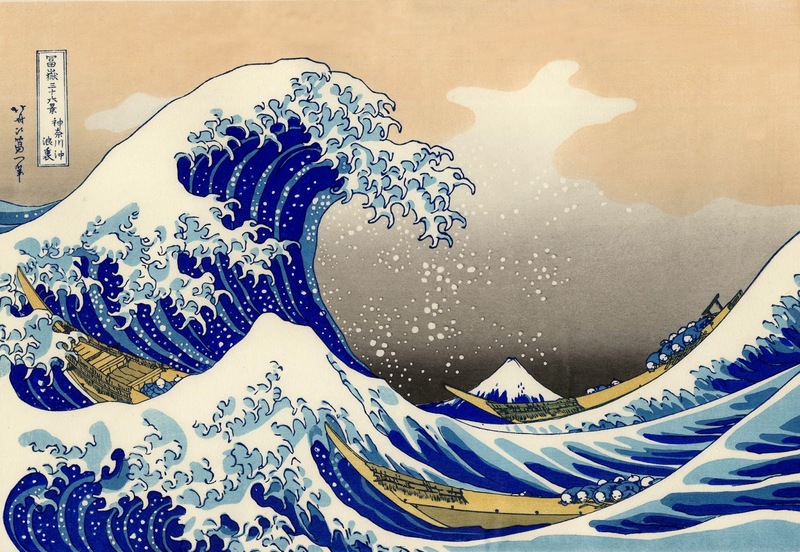 They are, in a sense, surfing the tsunami. One of these companies is "Loccioni", an Italian company dedicated to energy management and other hi-tech ventures. Recently, they organized an international meeting where I had a chance to participate. It was a rare occasion to see a small Italian company able to take such an innovative stance. Here, Tatiana Yugay of the University of Moscow reports on the event. 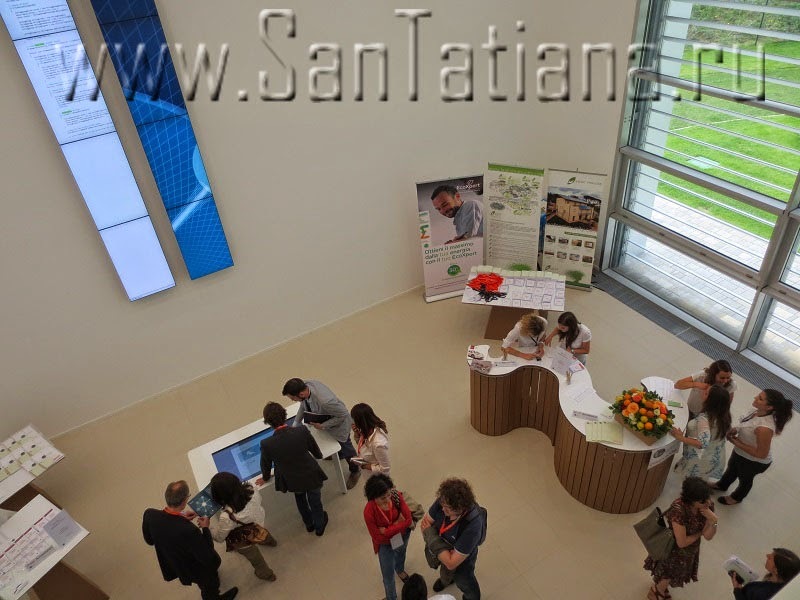 From Tatiana Yugay's blog "santatatiana"
On July 10-11, my virtual friend Prof. Ugo Bardi invited me to participate in an interesting event “2Km di Futuro: Smart Community and Social Immagination”. The name itself looked rather intriguing and furthermore I was intrigued by the fact that I couldn't find the locality Angeli di Rosora even in a very detailed road atlas of Italy. Fortunately, on the eve of the Forum the organizers had sent me a link to a specially created apps for the event. It was very helpful since the apps contained all the necessary info about the event, including the agenda and navigation. I found out that the road of about 200 km was very easy and it would take roughly two hours to get there from my town of Montesilvano, Abruzzo. In fact, the event took place in the neighboring region Le Marche. As I was driving inland by a picturesque highway Ankona-Rome, I wondered what a kind of surprise could I expect in the middle of nowhere? I love a tranquil beauty of Le Marche with green hills topped by tiny mediaeval boroughs. However, I couldn't imagine that one of those boroughs wold be capable to host an international meeting of such a scale. Nevertheless, all my doubts were dispelled as soon as I arrived at the place of destination, namely, the Loccioni group. On both banks of a small river and right on the highway Ankona-Rome, there were situated two big buildings with a modern industrial look. The courtyard and lobby were full of buzzing groups of participants. I had attentively studied a preliminary program beforehand and was very much surprised that almost all the declared speakers had really arrived. My long experience of participating in conferences suggested that VIPs never come and, at best, send their representatives. Fortunately, 2Km Forum was an exception to the general rule. We had a pleasure to listen and observe presentations by Piero Cipollone, Executive Director of the World Bank; Vincent Kitio, an Energy Advisor of the UN-Habitat; Vittorio Prodi, member of the European Parliament; Carlo Papa, Chief Innovation Officer of Enel Green Power; Young Chul Park, Vice-President of Samsung Electronics et al. Moreover, there were present about 200 attendees from Italian and foreign universities and enterprises. Enrico Loccioni, head and founder of the Loccioni group, opened the Forum. I was struck by the fact that the main keyword of his brief speech was “belezza” or beauty. The beauty of creating smart community, preserving the beauty of natural and architectural environment, the art of disseminating beauty and so on. The first session “Smart Community” was moderated by Massimo Russo, Director of Wired Italia. Prof. Ugo Bardi, who represented the Rome Club, opened the session. The title of his recent book “Extracted. How the Quest for Mineral Wealth Is Plundering the Planet” (Chelsea Green Publishing, Vermont, 2014) speaks for itself. The main pathos of his speech was directed against predatory use of non-renewable resources which causes damage to the planet's ecosystem and slowdown of economic growth. I follow Ugo Bardi's blog and always enjoy his encyclopedic knowledge and brilliant improvisations, however, I'm not that pessimistic. Maybe, because I live in Russia and teach economics. In fact it's difficult to be a catastrophist in a country so rich in all kinds of rare resources. The next speaker, Ken Webster of the Ellen MacArthur Foundation, presented an optimistic vision of a circular economy which challenges the appreciation and exhaustion of rare resources. According to Webster, the main concepts of the circular economy are the recirculation and “access to resources” as opposed to “ownership”. One more rival concept was presented on the second day by Enzo Rullani, professor at TEDis, Venice International University and Director of t.Lab of CFMT, Milan. As an expert on the knowledge economy, he presumed that the paradigm of rare, more and more expensive resources was well suited to the industrial capitalism but in the informational society the main resource is information which is abundant and has been becoming more and more cheap. I'm not going to give an account of all the presentations since they were far beyond my field of competence. Though, I'd like to mention one more presentation. Thomas Herzog, a German architect, who worked on the design of Loccioni's buildings and the surrounding area, described the masterplan of the project pace by pace. In fact, he had been realizing Enrico Loccioni's concept of belezza. The masterplan had to take into account not only the direct productive purpose of the buildings but also their aesthetic perception. As I wrote earlier, the site is surrounded by charming mediaeval hilltowns. According to Herzog, people who live in these villages use to look down at the valley where Loccioni's buildings are located, so he was always keeping in mind their bird's eye view. When I was walking over the bridge, I stopped to make a shot and remembered Herzog's words. You can see on the photos that the modern industrial building perfectly fits into the environment. After the session, there was a small tour about the enterprise. First of all, we could observe the prime concept of the Loccioni group - a micro-grid – in action. Then we watched how a young operator was training a robot hand to type on a computer keyboard. In the courtyard, a representative of Nissan was demonstrating Nissan hybrid cars. Meanwhile tiny robots were crawling on the lawn. After the first meeting, we spent a wonderful night in a genuine mediaeval atmosphere of St. Helene Abbey. The apéritif consisting of Le Marche's specialties was offered in a severe monastery setting. The main courses were served in an elegantly decorated enclosed porch. After the dinner, we were invited to the former church which now serves as a concert hall with an excellent acoustics. The Loccioni group had prepared a wonderful surprise for us. A famous Italian composer and pianist Giovanni Allevi played his brilliant compositions on the piano. He is very young and has a modern look with thick curly black hair and always wear black t-shirt and jeans. Frankly speaking, I'm not fond of modern piano music, but Allevi is a genius who lives in music, his “secret love”. The final accord was made by the picnic under a venerable oak. Local farms and winemakers presented very tasty typical Le Marche's foods. why you say with such confidence that the crisis is "caused by the high costs of mineral commodities which is destroying its industrial system and plunging the country in a deeper and deeper crisis"? don't look at macroeconomic problems with many different causes (different cumulated inflation levels in € area, to mention one ) with micro lenses..
What was the main objective (or the main objectives) of the conference, and do you think they were achieved and will there be any follow-ups by the various participants? It sounds like a very interesting conference with a diversity of speakers on a diversity of topics form a diversity of institutions and probably those who attended it all learned something from one another and also benefitted from networking but it is not clear what other objectives the conference may have had and how it was all supposed to come together. Did it come together and if so around what, and how and what is supposed to happen next? Thanks. "As an expert on the knowledge economy, he presumed that the paradigm of rare, more and more expensive resources was well suited to the industrial capitalism but in the informational society the main resource is information which is abundant and has been becoming more and more cheap." Is it possible to download this presentation made by Enzo Rullani somewhere? I am in the midst of writing a paper on topic of knowledge economy & natural resource consumption and so far the data are not very supportive of this idea, so it migh be interesting to see his viewpoint.